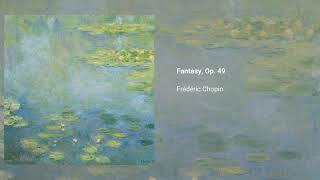 Frédéric Chopin wrote his Fantaisie in F minor, Op. 49, in 1841 (when he was 31 years old), and dedicated it to Catherine de Souzzo. It is a single movement piece that evolves through a number of sections and reflects a number of different moods: Chopin allegedly used the title Fantaisie to convey a sense of freedom from rules and a romantic expression.